For every sun line an animated video has been produced showing the passage of the sun’s shadow across the lower stone. It is precisely these animations that reveal what it looked like when the stone monument was in use during the late Iron Age. I recommend that you read the text in order to better understand what is being shown. The animations are in MP4 format which is supported by most video player programmes. On every animation are 2-4 lines (1). 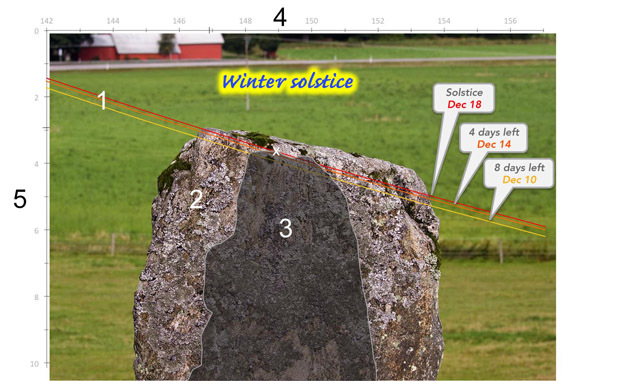 In the example below, which is a still picture taken from the video showing the winter solstice on Lundskullen, there are 3 lines in yellow, orange and red. The marking (x) shows exactly at which point on the shadow (3) it is fixed for each respective line. The fixed point is not marked on the animated video. 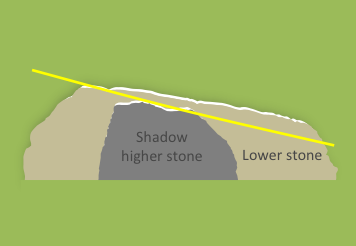 The animation shows the shadow moving along the line across the lower stone (2). The three lines show the shadows movements 8 and 4 days before the winter solstice as well as on the winter solstice. The date given is in accordance with the Julian calendar for the year 645 AD. The scale that is somewhat toned down in grey (4 & 5) is applicable to the sun. This means that the direction that the photo is taken from is actually in the exact opposite: when the sun is at 150º the shadow is at 150+180= 330º. The scale is designed to allow a direct reading of the suns position as the shadow moves across the stone. This also means that the height scale has been turned so that the highest value is farthest down on the scale. One of the stones, but normally both, has a gradient at its top that conforms relatively accurately, even if not perfectly, with the suns path. The sketch on the right indicates the gradients at the top of the stones with white lines and the suns path with a yellow line.